Almost all the languages in the world that do not have a translation of the Bible do not have a dictionary or other books or resources. So learning one of those languages is not a matter of enrolling in a class, buying a piece of software or getting a book, as one might to learn Spanish or Chinese. So, what does a missionary do? Well, it’s not exactly easy but people have developed a number of techniques that help a lot. 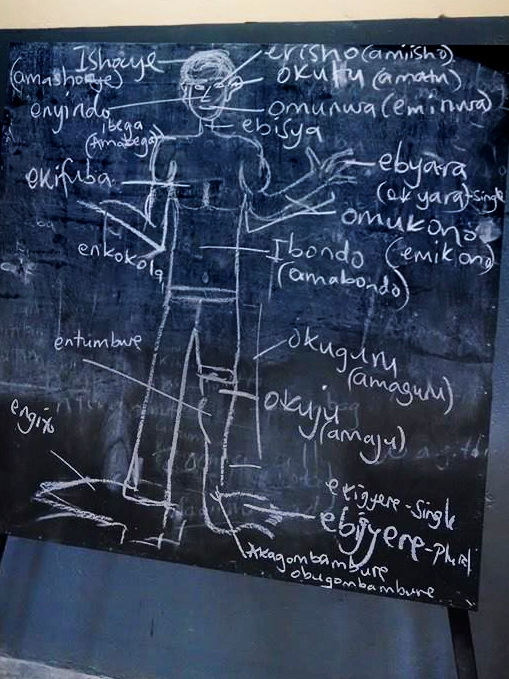 This photo illustrates one technique: draw a picture or take a photo of something, then have someone tell you the names of the various parts of it. This works for lots of things: the body, houses, tools, plants, animals, countryside scenes, etc. Then you write the words on the drawing or on the photo. The drawing or photo also makes the words easier to remember, and certainly a lot more fun to review! What if the language does not have an alphabet? No problem! Spend a little time learning the International Phonetic Alphabet (IPA) which has a letter for every sound made in human speech. Hint: Ask a linguist or Bible translator and they can tell you what part of the IPA to learn and which you can ignore for the country where the language is. Or, you can just invent new letters for “strange” sounds. 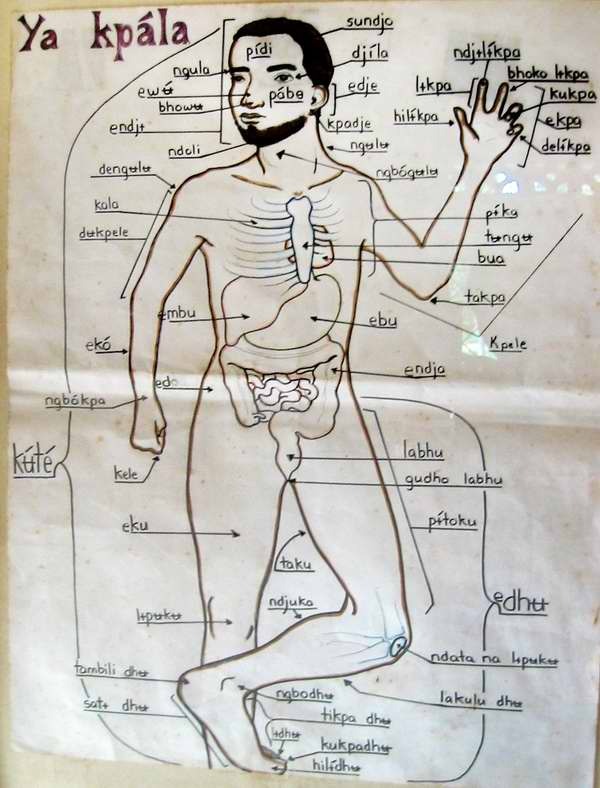 You can add internal organs, as for this drawing in the Mayogo language of Congo. Or, you can break the picture down too. So from the body you can move to just the hand and get all the parts: fingernails, knuckles, thumb, finger, index finger, little finger, and so on. This works great for getting family relationships straight. Make a friend and take some photos of his family. Then you can get the words for brother, sister, father, mother, uncle, aunt, cousin, and so on. This method also allows you to discover how people look at the world. For example, the foot and lower leg might have the same name. Or there might be a different word for older brother and another for younger brother. These differences show up more quickly and clearly when working with a drawing or photos. If you want, you can take this a step further. The local person you are working with might have to get the hang of it at first, but you can point to something on the photo or drawing and ask; What do you do with this? So in answer to “What do you do with a hand?”, you might get wave, stir, shake hands, carry, give, take and so on. Best, when local people get the hang of what you are doing, you can turn it into a game. Have fun, connect with people, show their language and culture respect while learning it! This entry was posted in Bible translation, Heart language, Language, Linguistics and tagged language learning. Bookmark the permalink. This was perfect timing for me, Ed. I’m almost done doing an online course on learning to be a language coach, and this is one of the methods suggested in helping learners to learn a new language and culture (from ICCT, if you’ve heard of it.) I’m going to try to help in this area in Nbi the next time we go, hopefully in Jan. So thank you very much for adding to my resources. How are you guys? Haven’t heard whether or not you got your “new” car yet, although I think you wrote you found what would work for you. Also that you would find your own living place soon, if not already. We are still working on the “new” car. Maybe in a month or so. We do, however, have a very nice place to live which is also close to work and reasonably priced. You make it sound so easy! !